The images that we see form a construct in our brains of what may be reality. For half-a-century, the two-dimensional shadow images of the coronary arteries, as served up by the "gold standard" of selective coronary angiography, have informed cardiologists as to what a stenosis is, how severe it is, where it stops, starts, what it's composed of and, perhaps, how to best treat it. But newer intravascular imaging modalities have challenged those black-and-white renderings, and have offered a more accurate image of what in fact is going on inside the coronary arteries: accuracy that has resulted in better outcomes for patients and potentially lower healthcare costs due to less repeat procedures. The diagrams to the right show an actual LAD blockage and an artist's rendition of the same.. Certainly that fluoroscopic shadow image can be measured, comparing the narrowed area to what looks like the full size of the artery before and after the blockage. And it can be pronounced an 80% or 90% stenosis. This is, however, a measurement of the image, not necessarily of the arterial blockage itself, because the angiogram is, in essence, a two-dimensional "shadow image" of the artery. For example, what if this blockage, or stenosis, were eccentric? What if viewing this artery from a different angle showed less (or more) narrowing because the blockage was oval-shaped in the extreme? What if the disease actually spanned a greater length than the angiogram showed? What if the entire segment of the artery were diseased and the native arterial diameter was actually wider than the angiogram showed? Enter intravascular imaging and guidance, in the form of intravascular ultrasound, or IVUS. An ultrasound imaging device is quickly threaded over a wire and through the catheter that injected dye for the angiogram. A special "ultrasound camera" is able to see through the plaque and determine where the actual native wall of the artery would be (if the plaque were not there). This same "camera" also images the plaque itself -- and with some systems, such as VH-IVUS, is able to characterize the plaque (hard, soft, calcified, lipid-rich, etc.). The IVUS imaging device is then "pulled back" through the entire arterial segment, generating a rapid series of cross-sectional images which are quickly processed into a longitudinal reconstruction of the artery. As can be seen in the above image, the IVUS reconstruction is not a shadow image, but an extremely precise and measurable roadmap to the artery. The software quickly measures the diameter and length of the blockage and tells the cardiologist exactly the diameter and length of the stent he will need to optimally open this blockage. At the beginning of the stent era, problems began to arise with excessive restenosis (re-blocking of the artery) and stent thrombosis (blood clotting inside or around the area of the stent). 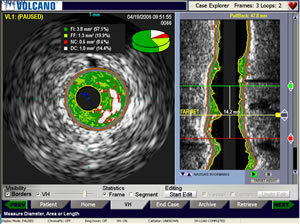 IVUS was, at that time, a very new imaging modality. And one of its proponens was Milan-based Dr. Antonio Colombo. He used IVUS imaging before and after stenting and looked at patients where the results of the stent had been poor. And what Colombo found has changed the way stents have been deployed ever since. When stents first came into widespread use, cardiologists understandably were overly cautious with this new technology. They were afraid to expand the stent too far for fear of over-expanding and tearing the artery. But Colombo's IVUS images showed that many, if not most, stents were being underexpanded, underdeployed -- that they weren't being fitted snugly against the arterial wall. The result of this underexpansion was that the spaces between the stent and artery wall became areas susceptible to platelets collecting and forming clots, or tissue growing and causing restenosis. Like an ill-fitting door or window, the space around a too-small stent was causing the exact problem it was trying to eliminate. So cardiologists began using high-pressure balloons to expand the stents fully. And the only true way to measure the exact diameters and lengths was to use a technology like IVUS. If the cardiologist knows the precise size of the artery and the blockage, he or she can size the stent correctly and expand it fully...and safely...without worrying that the stent is going to overdilate the artery. And to make sure that the stent is long enough to cover all the disease (implanting a stent edge in a diseased area is a sure way to cause reblockage later on). Just as angiography first gave doctors a way to think visually about the coronary arteries, intravascular imaging modalities like IVUS are now giving cardiologists a new, more complex and more accurate way to "see" and treat coronary artery disease: an IVUS state of mind. "Almost all. It depends. In a public hospital sometimes I am pushed by the schedule, by the patient load, so sometimes I have to make some practical decision. If the lesion is very simple, I cut short. But still, having used IVUS most of the time, I have acquired what you might call an IVUS background, an IVUS mentality.... So I always think of the vessel as a little bit bigger than the way it looks. But I’ve been working in this field for more than 25 years, so sometimes I assume that I know...."
Taking an IVUS image adds only minutes to the procedure and studies show a correspondance between IVUS use and lower rates of restenosis and thrombosis. Take, for example, the experience of Japan, where IVUS is completely reimbursed by insurance and so is used in virtually every PCI. When randomized clinical trials of new stents are published, the Japanese cohorts always show lower rates of complications. So Angioplasty.Org asked Dr. Shigeru Saito, principal investigator for many of these clinical trials and studies, why this is the case? Why are the Japanese results always better?